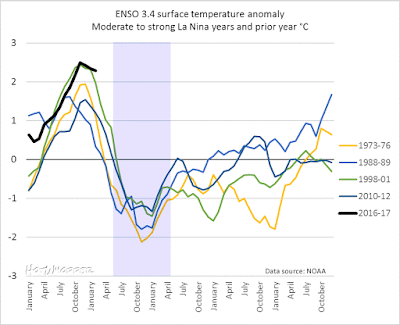 For winter and spring, climate models favour ENSO neutral slightly ahead of La Niña. However, accuracy of forecasts made at this time of year are lower than those at other times, and therefore some caution should be exercised. 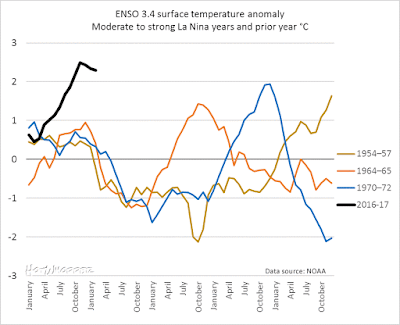 Despite the label on the Reuters chart, three of the years shown in the chart in Figure 2 above were not followed by a La Niña, according to BoM, and one of them (2004-05) wasn't an El Niño year. 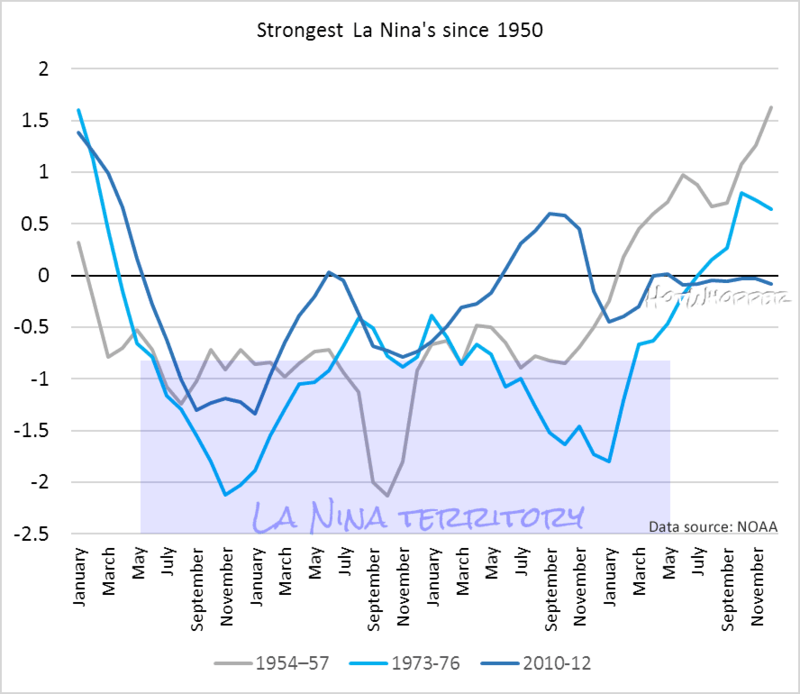 For the sake of completeness, here are some charts showing moderate to strong La Niñas since 1950, starting prior so you can see which were preceded by an El Niño. 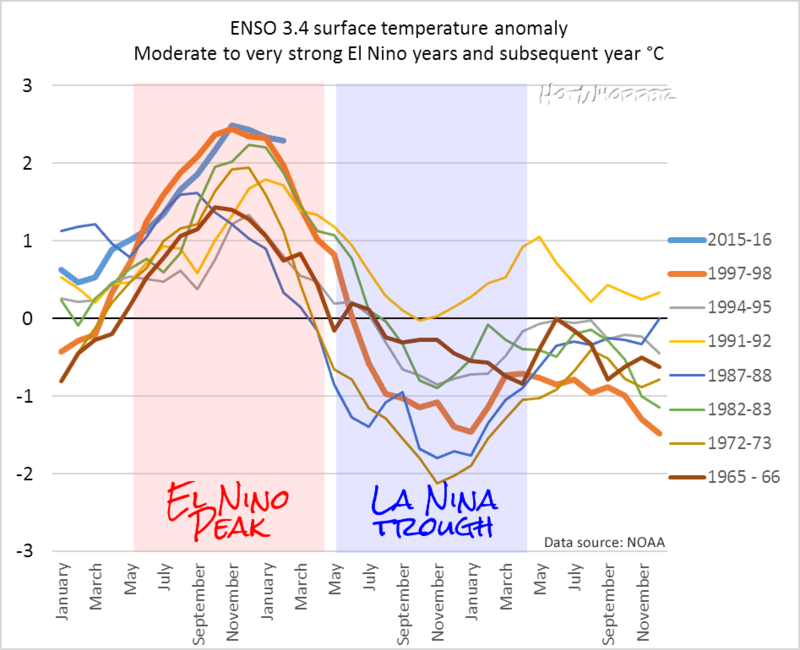 The chart below is of moderate to strong La Niña years that were not immediately preceded by an El Niño (of any strength). 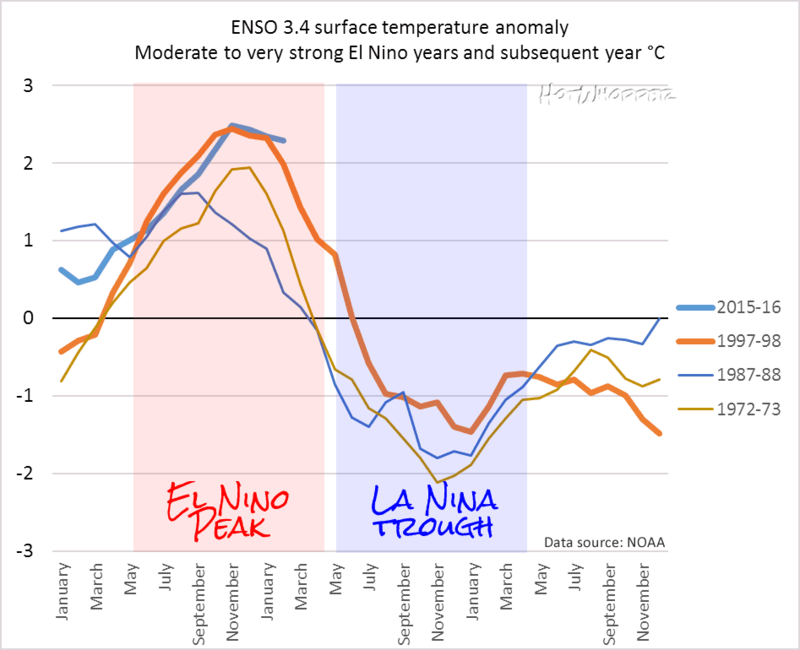 There are only three moderate to strong La Niñas that weren't preceded by an El Niño. They are 1954-57, 1964-65 and 1970-72. Will there be a La Niña this year? 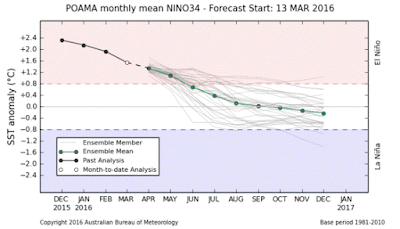 BoM says the chance is slightly against a La Niña developing, but urges caution. This time of the year is not the best time for making any predictions. Your guess is probably as good as mine or better, and I'm not guessing. So you're stuck with your own guess or you can choose from the guesses of Anthony Watts and Karen Braun, or the predictions or lack of predictions from the experts. Although I took issue with one of her charts (Figure 2 above), Karen Braun's article did contain some very good information that Anthony neglected to copy and paste. You can read the full article here. 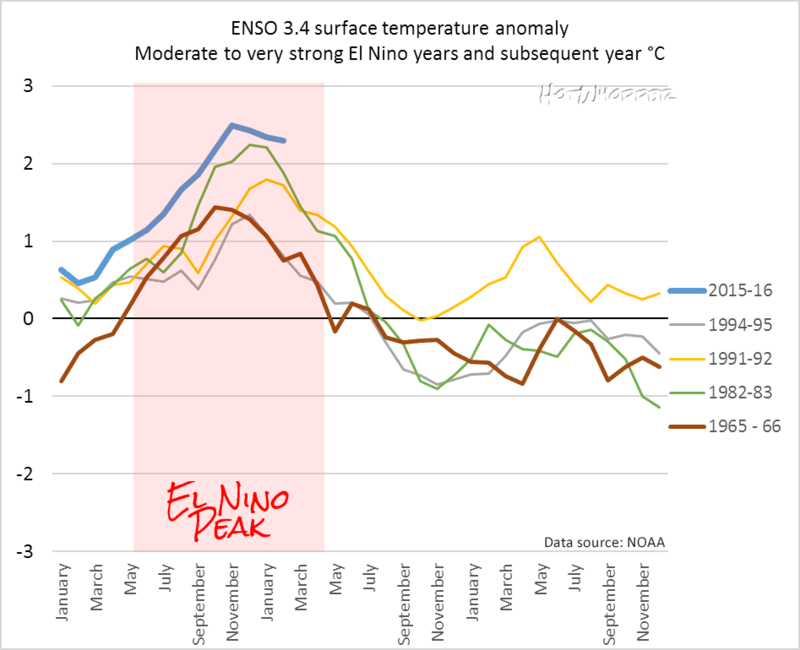 As a bonus, and in case you missed it, below is the comparison of this year with the two previous hottest years having an El Niño. This is a plot of global mean surface temperature, whereas the charts above are just the Niño 3.4 sea surface temperatures. 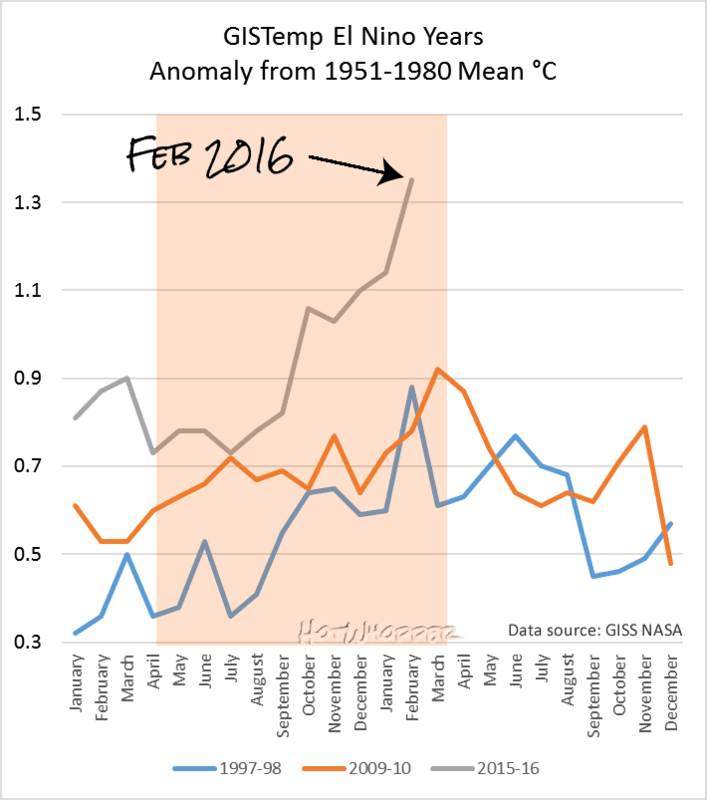 Not everyone is as confident as Anthony Watts that a La Nina is about to descend, though a few of the deniers are. A lot of them don't know much about ENSO events, despite or perhaps because of Bob Tisdale's articles. 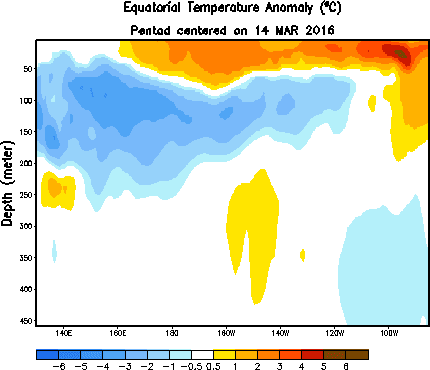 The Pacific is definitely rapidly transitioning to a La Nina state. All this blue colder than normal water in the undercurrent is going to surface soon and become the La Nina. This Upper Ocean Temperature Anomaly chart shows that the average ocean temperature down to 300M from 180W to 100W has already transitioned into below average territory. Traditionally, this value leads the Nino 3.4 index by about 1 month on a very consistent basis. That may be so or not. 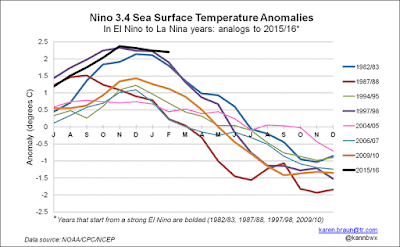 What it doesn't indicate is that a La Nina is necessarily going to happen this year. For one thing, it takes more than a drop in sea surface temperature, winds (and associated pressure gradients) matter too. I predict no global cooling, as those who control the data will make some epic adjustments. Such is climate science today. Adjusting/manipulating/homogenising/torturing data to meet the requirements of the Klimate Establishment is one of the great tragedies of our world today. Any global cooling will be blamed on “global warming/climate change”. Like day follows night. redc1c4 pokes fun at the WUWT ice age comethers. ENSO and QBO are indeed difficult to predict. "La Nada" is not a bad name for Anthony and his disciples understanding of climate science. 4. The text, photographs, video, graphics, metadata, quotes, data, information, the overall “look and feel”, and all protectable intellectual property available through the Service (“Content”) is the property of Reuters and its licensors. It is provided by Reuters and its licensors to you for your personal use and information only. You may not use the Content or Service for any commercial purpose. You may not remove, alter, forward, scrape, copy, sell, distribute, retransmit, create derivative works or otherwise make available the Content to third parties without our prior written consent, except as occasionally permitted by any sharing functionality in the Service that expressly allows you to share Content or links to Content with a few other individuals. Tony may have asked permission, but one would think he would be required to provide a proper reference to the source, not some cherry picked bits of the story. Since Tony's site includes several adds, I think his site qualifies as having a "commercial purpose". Perhaps Reuters would take him to court (in New York state), if a complaint were entered. 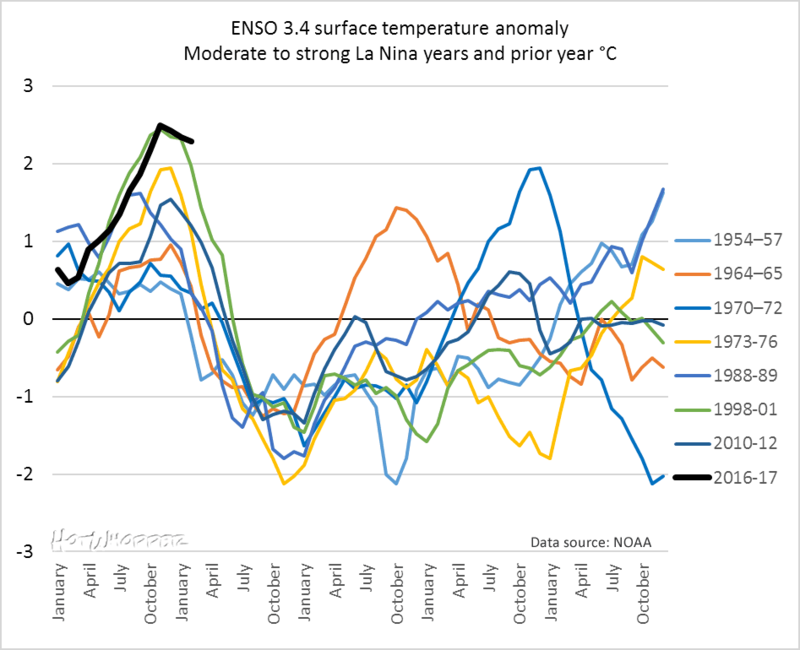 Not sure why everyone is using Nino 3.4 to determine La Nina. 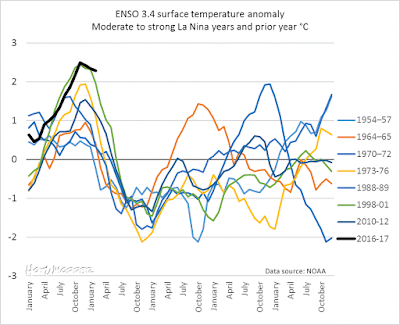 The determination is made based on Nino 3.4 being below -0.5C for five consecutive months. The ONI data would be a better indicator since it's the average of 3 months. To expand on RobH's comment - AFAIK different agencies use different measures and/or a combination of indicators - like sea surface temperature, winds and pressure differences. BoM uses SOI as well as SST (SOI is the difference in surface air pressure between Tahiti and Darwin, +/- 0.8 as the thresholds). In the article I used the BoM record of ENSO (as linked above), so it is based on SOI as well, not just sea surface temperature. So, I wonder how aware Tony is of this? 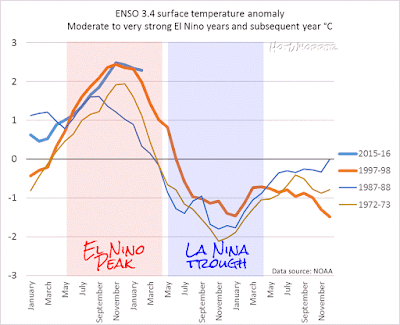 Is he deliberately or incorrectly using Nino3.4 as his measure of La Nina? I could easily see the Nino3.4 figures dropping below -0.5 for a month and Tony praising himself on his prognostic skills, but then see the figure pop up again and him not ever make a mention of the fact that he was wrong. 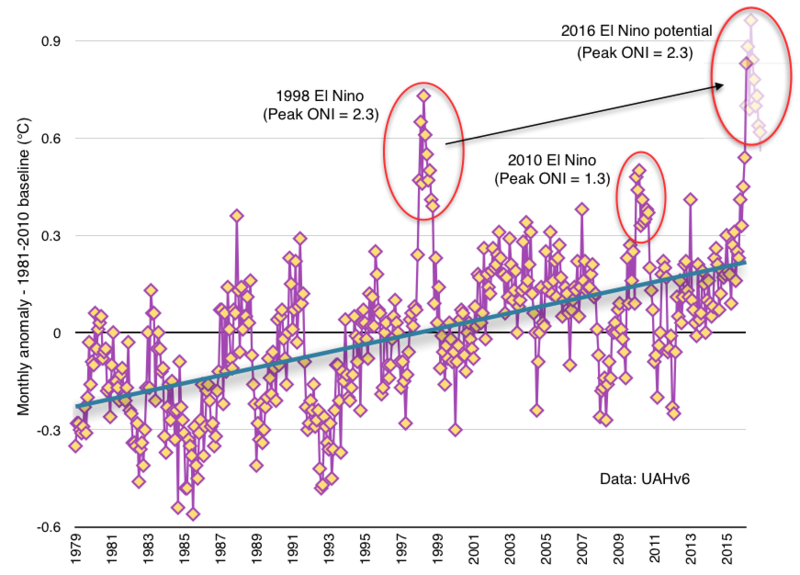 I was noting here that, after the 1997/98 El Nino temps only dropped back to the long term trend. And that's even though we went into La Nina for almost a full 3 years! 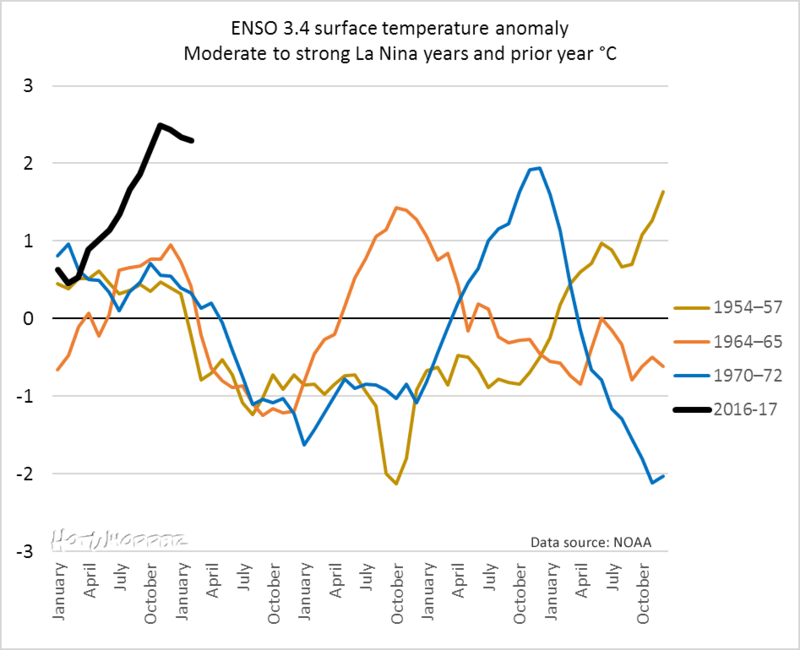 In essence, the La Nina that followed did little or nothing to offset the heat that was released to the atmosphere during the El Nino. I'd guess the same will happen this time around regardless of La Nina. Here's another funny little tidbit I just noticed on Tony's site. His ENSO meter. His meter goes from -3C to +3C. 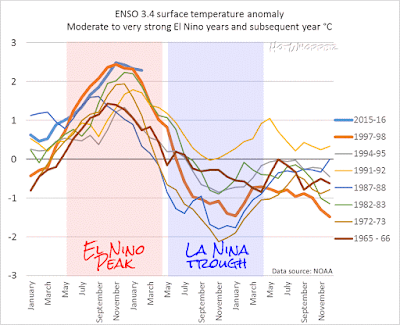 The highest an El Nino has been is 2.3, and the lowest for a La Nina is 1.6. If his meter ever goes into either extreme state, we should be extremely afraid. 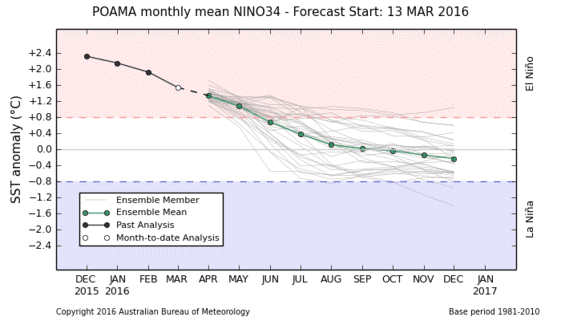 Given the estimated 40% chance of a 2016 La Nina Mr Watts is putting down a marker. As about a month later La Niña is not yet emerged but it is now more probable. I messed up my comment so I'm re-doing it. 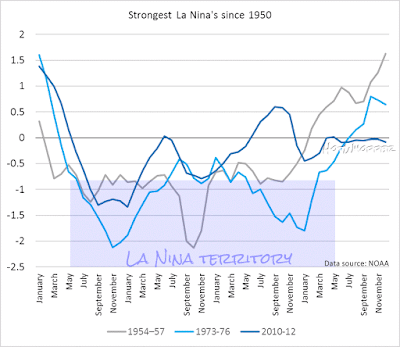 It is 100% certain we will have a la Nina at some point. The odds of a la Nina beginning before the end of this year are pretty good. However, Watts and the deniosphere want us to think a la Nina means there is no such thing as climate change, because it will un-do any warming the Earth has exhibited since, oh, 1979 or so. The problem with that thinking is that years with la Ninas have been getting warmer over time. 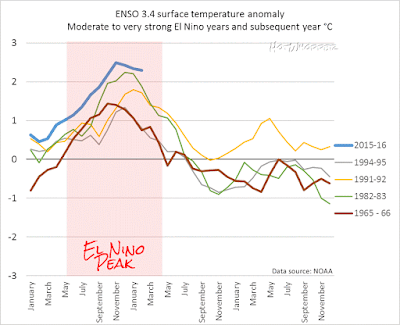 Years with el Ninos have also been getting warmer. So have neutral years. 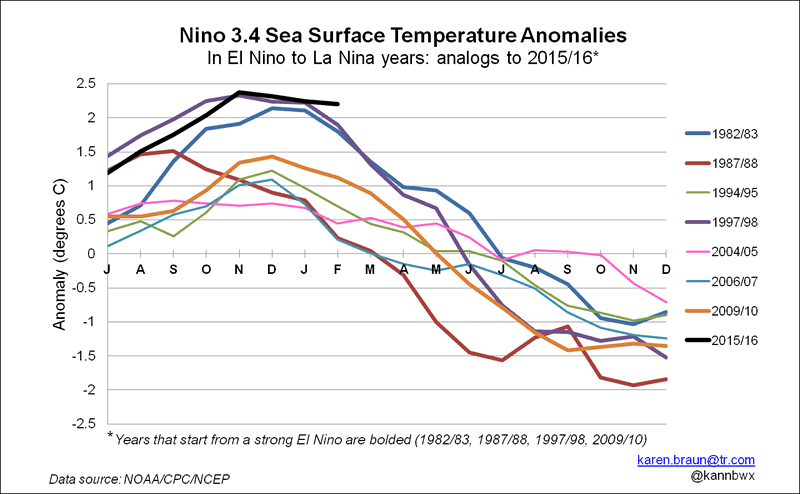 So the cometh-ing la Nina is pretty meaningless, and hanging one's hopes on it to un-do global warming is plain silly. 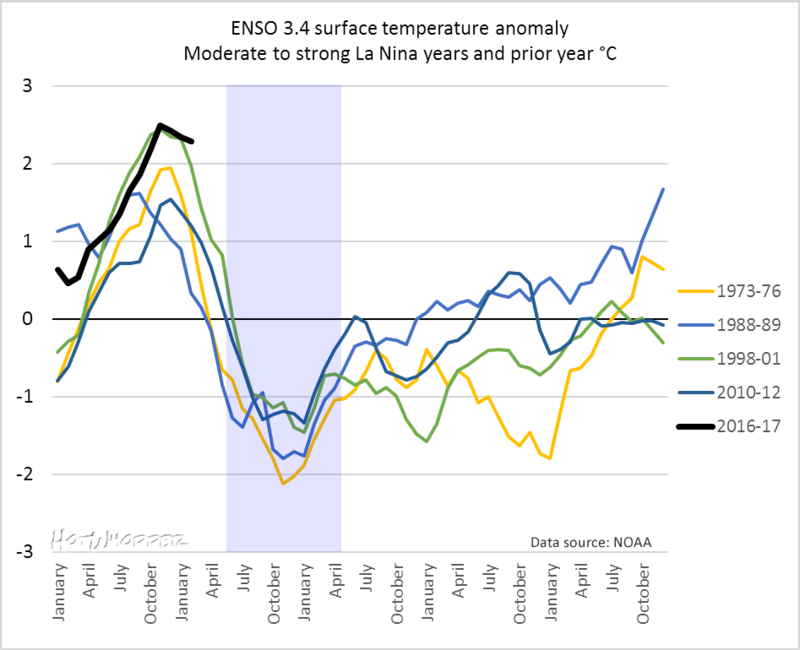 If the next La Nina is the warmest on record, which it likely will be, that will be a talking point in itself. It's just warmest this after warmest that without end, and not even a Pause to cling to. Cugel...Surely you know that Tony will measure the "pause" or "recovery" from spring 2016 only whether followed by a warmest la Nina or no. He will certainly not show any time span which would allow the observation you are proposing even if that observation occurs.